As the first ride as part of my preparation for the Big Red Ride I took a longer route home that usual on Saturday. There were after work drinks on Friday night so I had left my bike at work. On Saturday I got the tube in to ride home. 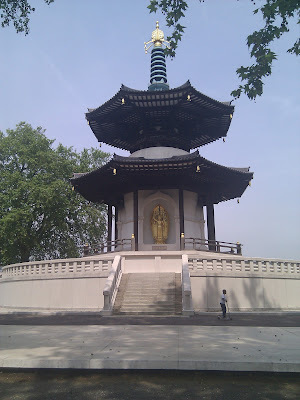 The route I took was a combination of 2 of the routes in my new eBook: 25 London Cycle Routes. I managed to load the route onto my phone so I could check up where I was whilst I was cycling without needing to take a load of print outs with me. To get gpx files on your android phone I would recommend the Apps My Tracks and Linda Manager ( a file manager). I enjoyed my cycle. The routes generally worked pretty well. There was one bit where I couldn’t get onto London Bridge using the exact co-ordinates but it was easy enough to work it out when I was there. I was actually running the route backwards which probably didn’t help. The weather was gorgeous and I covered 20 miles in around 2 hours. I did have to stop quite a bit to check up on my route which was a bit annoying but a phone mount for my bike which I have ordered should sort that. I saw some lovely bits of London that I would never normally have come across. 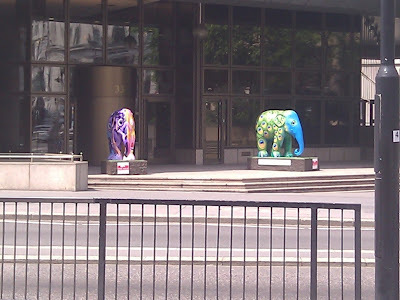 I even came across 2 of the Elephant Parade elephants on my route (right). I also saw the temple pictured above. I look forward to trying some of the more challenging routes from the ebook. Next week I have a 30 mile trip planned with Evans. Here’s hoping for good weather. I am looking forward to it.